As Village goes to press the Oireachtas Banking Inquiry committee members are frenetically working on the long-awaited final report after weeks of controversy about an interim draft which was described by members of the committee themselves as “unsatisfactory” and unpublishable. However Village has learned that the crisis over the showcase State inquiry which has rumbled along for over a year is very far from over, thanks to a the ongoing efforts of a former member of the inquiry team who has been attempting to blow the whistle on a series of catastrophic failures in the investigation behind the public hearings. Now with the final publication deadline of January 20 2016 looming, and political spats erupting on all sides about it, the whistleblower has emerged from the shadows with another forensic attack on the inquiry itself, alleging it allowed the Central Bank to engage in a cover-up. The whistleblower initially made a formal complaint under the Protected Disclosures Act, which protects anonymity, outlining a range of detailed concerns about how the Central Bank and some of its legal representatives were omitting huge swathes of vital documents, redacting many of the most crucial pieces of evidence, and delaying release of vital material until it was too late to use them in briefings for public hearings – in at least one case handing them over 24 hours before a scheduled interview about them. Now, following an inquiry into the matter by Senan Allen, SC, which dismissed the concerns, the whistleblower has made a second Protected Disclosure to the Oireachtas and the committee members, and is preparing for a public battle with the authorities involved in the inquiry. The new disclosure – which runs to dozens of pages – is understood to outline in scathing detail a series of revelations about the failings of Allen’s inquiry and how an increasing body of evidence and other witnesses have shown the concerns to be not only valid, but systematically ignored by the inquiry team. However, despite the seriousness of the claims, members of the Joint Oireachtas Committee who are holding the public hearings have been denied access to its contents. The document remains confidential, but sources close to the inquiry have briefed Village on some of the arguments. Like the previous complaint, it is suggested that all the claims are substantiated with either documents or transcripts of the interviews conducted by Senan Allen with the whistleblower – who insisted in advance that they be recorded in order to protect the whistleblower’s reputation from any attempt at a ‘whitewash’. No-one who has seen the document would release a copy but Village has confirmed some of the claims from a number of sources. 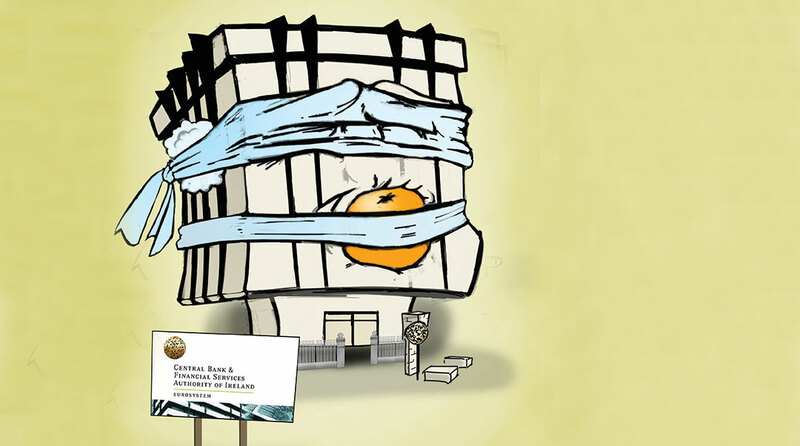 In September, two weeks after public hearings had ended, it emerged that one of the most senior members of the Central Bank (CB)’s regulatory apparatus in the years of the boom, had made a statement to the inquiry which directly contradicted what the senior CB executives had claimed. Most importantly with regard to the claims raised by the whistleblower, Browne wrote that he had been “informed by the Banking Inquiry that a Book of Core Documents has been compiled to the specific themes that I was asked to address [but] on examining this material, it became very clear to me that a large amount of critically important material was omitted. The inquiry team asked Browne to limit his submission to the inquiry to 12 lines of specific responses, but he chose to submit an additional annex of almost 70 pages of forensically detailed and documented critique of the Bank’s position that it was not in denial of the fragility of the Irish economy. In his statement he wrote that warnings about the property bubble and insufficient liquidity ratios at the banks were “toned down or even ignored completely by the senior management of the Central Bank and Financial Services Authority [and that he warned] that the Bank needed to commence important preparatory work in the area of crisis prevention and management”. He continued: “Unfortunately, these warnings were not listened to. As explained later in this statement when corroborating evidence also pointing to substantial overvaluation in the Irish housing market emerged in 2007, the results were suppressed in favour of an overall conclusion that presented a favourable perspective on the housing market and on financial stability more generally in Ireland”. In explaining why he believes the Bank chose to act this way he said “one reason why action was not taken was, in my view, attributable to the organisational culture prevailing in the Bank at that time. Senior management was reluctant to countenance any dissent from the ‘right’ message”. Browne included a USB memory stick with his submission and stated that he had uncovered a series of hand-written minutes of committee meetings, and offered “supporting documents [which] also comprise presentations, papers and analyses prepared and submitted to senior management at the Bank,” adding: “it is, therefore, important that this statement be considered in conjunction with the accompanying documents cited therein”. Despite the extent and detail of his submission, and its obvious relevance to the inquiry, Browne was never asked to appear as a witness, and his statement was only released after hearings had ended. His omission as a witness was described by economist Cormac Lucey as an “odd decision” and he pointed out that despite its remit to investigate Ireland’s crash and the fact that the Central Bank has a “duty to protect the country’s financial stability” no effort was made to assess the difference between Browne’s claims and what Lucey highlighted from the November 2007 financial stability report, which was published during Browne’s time at the Central Bank. “The Irish banking system continues to be well-placed to withstand adverse economic and sectoral developments in the short to medium term”, it said. “The underlying fundamentals of the residential market continue to appear strong and the current trend in monthly price developments does not imply a sharp correction. The central scenario therefore is for a soft landing”, it added. Following the recent publication of his statement some of the bank’s management responded with lines reminiscent of Tribunal-speak, such as Hurley who said he was “not aware of contrarian views” in the bank and that Browne should have ‘defended his work’. John Hurley added: “Liam Barron, director general from 2000 to 2007, also rejected Mr Browne’s assertions. It is most regrettable that he has chosen not to defend his work rather than making statements which I consider to be unfounded and baseless”. Frank Browne was not the only the witness cited by the whistleblower as deliberately omitted, however. According to sources familiar with the document the whistleblower now claims the Joint Committee inquiry was “grievously incomplete” without hearing evidence from Jonathan Sugarman – a banker who approached the Central Bank in 2007 about significant breaches of legislation on liquidity ratio reporting by Irish banks and whose story has been recounted at length in the pages of Village. It is understood the whistleblower focuses on refuting a number of Allen’s findings point by point, and claims that Allen did not review any of the supporting documentation offered and that as many as five witnesses, offered to corroborate the claims, were not called or interviewed. The whistleblower had previously claimed that at least one of the inquiry’s investigations team had left following the effective suspension of the whistleblower from the inquiry’s work and this was confirmed to Village by Oireachtas sources. One source said that Marc MacSharry, a committee member, has reviewed the whole handling of the whistleblower’s complaint and the inquiry itself and said the whistleblower was “thrown under a bus” and “in fact the claims were borne out”. Members of the committee were notified by the whistleblower’s lawyers on November 25 that a new file had been submitted. Sources say Deputy MacSharry contacted the acting head of the Oireachtas Service, Peter Finnegan, demanding a copy of the letter and his response. On December 1st Mr Finnegan replied to say it was “being dealt with” but would not be released. The Chairman of the committee, Ciaran Lynch, refused to confirm or deny the receipt of the letter. However one Village source, also familiar with the history of the whistleblower’s claims, said: “Frank Browne’s stuff emerged and when put with Tom O’Connell’s evidence it showed that there was more wrong with the central bank than meets the eye at first and that the reputation of the bank was protected in all of this. The disclosure was first sent to some of the members but they sat on it but told nobody. It was only when the rest of the members were sent it directly by the whistleblower that it was acted on. The shutters came down and it was appalling. There is a suspicion that the process was ‘managed’ in terms of who was being interviewed and about what. Senan Allen did not interview the key witness who allegedly left for the same reason as was alleged by the whistleblower, and he didn’t review even a sample of the material that would have been important to understand the work that was being done and the whistleblower’s concerns about it. It changed the approach of witness-management and direction-management. I’m not saying there’s a secret story in there that we’re not managing to expose but it makes you wonder”. Some members of the committee were never alerted to Frank Browne’s testimony and only discovered it by chance and insisted it was published. It is understood the the whistleblower has offered to self-present in committee hearings to testify to all the claims and offer evidence, and it is understood is preparing both a publicity campaign to coincide with the publication of the report, and a legal action against the Oireachtas over the way the whistleblower has been treated. The inquiry has already been dubbed a stillborn attempt at transparency because of its terms of reference, which were critically alluded to by one of its members the day before publication of this magazine. McGrath was referring to the fact that the report is restricted from making findings of fact or adverse findings against named individuals. For months the public have seen the big beasts of the crash – Brian Cowen, former Central Bank Governor John Hurley, the heads of the pillar banks and the most infamous developers – troop through the committee chambers admitting failures in varying incarnations of the mea maxima culpa. But what the whistleblower claims is that those not called are even more significant. 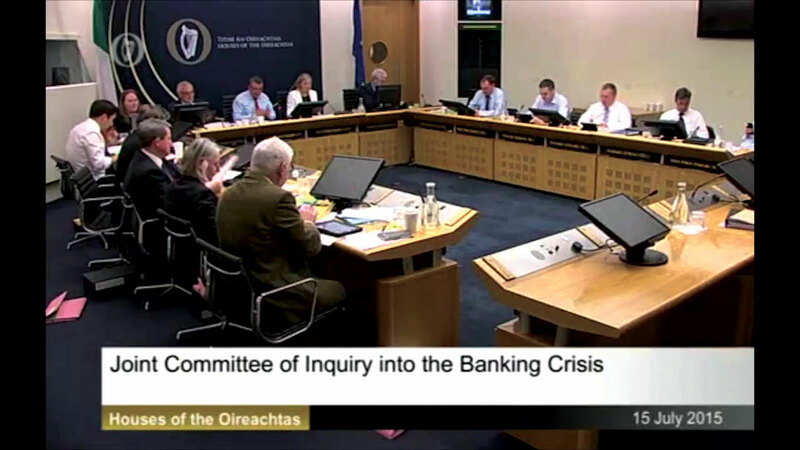 According to sources familiar with the document the whistleblower now claims the Joint Committee inquiry was :grievously incomplete” without hearing evidence from Jonathan Sugarman – a banker who approached the Central Bank in 2007 about significant breaches of legislation on liquidity ratio reporting by Irish banks and whose story has been recounted at length in the pages of Village. How the committee, already under fire and struggling to produce a report the nation has been demanding for five years, will cope with the publicity around renewed complaints from the internal whistleblower, remains to be seen. Following the initial complaint, Senan Allen SC was appointed to review it by the Oireachtas Commission and found there was “no substance whatsoever in any of the allegations” put forward by the whistleblower. His report said the allegations “contained suspicion and conclusion but much less in the way of hard information”. The report added: “The confidential informant is shown by the contemporaneous correspondence and documents to be a wholly unreliable historian”. The investigation began after the whistleblower submitted an 82-page document in July under the Protected Disclosures Act alleging improper running of the inquiry and in particular that preferential treatment had been given to witnesses from the Central Bank and the Department of Finance. Senan Allen responded to say: “It is inappropriate that I should make any comment in relation to a professional engagement as a barrister. For the avoidance of any conceivable doubt, my decision not to comment must not be taken in any way as an acceptance of anything you suggest”. The Oireachtas Commission press office also accepted queries about the new submission by the whistleblower but did not reply before publication, and four of the committee members contacted with details of the story for comment did not reply. In the last week of November the committee met in crisis mode and agreed to a ‘revised draft framework’, reducing the document from 27 chapters to 10, with sections on burden sharing, the banks, the role of State authorities, the 2008 guarantee, and the 2010 bailout. In the week before publication of this edition of Village the committee members tabled over 100 amendments which have to be addressed in the final draft due to be finalised in the first week of December, with a two-week statutory period for anyone mentioned in the report to be contacted and given an opportunity to respond. As the pressure to produce a report increased, amid much speculation that the final document will produce little of value, the committee has formed a finalisation team, headed by Eoghan Murphy of Fine Gael and Labour Senator Susan O’Keeffe, to produce a slimmed down version which should be published by the January 20th deadline. Some of the committee members had reportedly already bemoaned the amount of work they would have to do over the Christmas holidays to get the report ready for publication in credible fashion. It seems now that they may face far more difficulty in achieving the latter than they realised. Previous article Hypocrisy about Whistleblowing. Official Ireland is indifferent. This time about Donegal. Next article socceruption: FIFA and integrity.